The autobiography of Iceland's first billionaire, ruined in the Landsbanki collapse, is a gripping and unsparing account of an entrepreneur's life, says Nick Leeson. There is no doubt that the commissioning editor who asked me to review this book had a sense of humour. 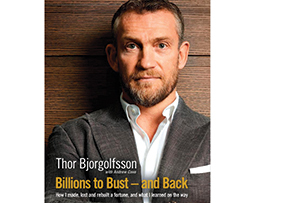 Thor Bjorgolfsson had made $4bn by the time he was 40 and lost most of it by the time he was 41. His fall from grace was perhaps the most fantastic of all time; from the heights of the cover of Forbes magazine as Iceland's first billionaire to the lows of a national pariah who rightly or wrongly was judged to have caused the collapse of a nation. As the original rogue trader, whose unchecked risk-taking caused the collapse of Barings Bank, I, too, have experienced personal boom and bust (albeit on a much smaller scale and when I was considerably younger) – I was born in 1967, as was Bjorgolfsson. It must have been a great year for putting people through the wringer! I approached the book with an open mind. Thor's name wasn't recognisable to me and I've only been to Reykjavik once, in September 2007, to deliver a talk on risk management and warn against complacency. Back then, the economy was booming, property prices were doubling and stock markets were flying. Failure wasn't an option and I was reminded of a satirical image of bosses asking their employees to stand in a circle and give the employee in front a pat on the back. Everyone was applauding a job well done. Bjorgolfsson was the poster boy of it all. But the applause masked one crucial fact: nobody had a clue what they were doing. Bjorgolfsson made his initial wealth in the 1990s in Russia. He spent 10 years establishing his financial empire with alco-pops and beer in the lawless 'wild west', drinking hard, fending off mobsters and even negotiating with the then-deputy mayor of St Petersburg, Vladimir Putin. He moved on to merging, floating, spinning off and privatising businesses from Finland to Sweden, Poland to Greece. By his 40th birthday, he had assets of around $4bn. He celebrated on his favourite Caribbean island with Jamiroquai and 50 Cent as part of the entertainment. The investment he made with his father in Landsbanki, Iceland's oldest and second-largest bank, which was privatised in 2002, brought it all tumbling down. When financial meltdown hit Iceland in 2008 and Landsbanki collapsed, it took Bjorgolfsson with it. He had the biggest balance sheet and the biggest exposure to the economy while having little or no understanding of how weak the state really was. He was the biggest deal junkie with the biggest appetite – and it was always going to end in disaster. Entrepreneurship and dogged ambition were ultimately no match for the brutal might and efficiency of the global financial markets. Bjorgolfsson lost 99% of his wealth and, in his own words, he went from 'Caribbean hero to Icelandic zero' within 12 short months. This book provides fascinating insights into where Bjorgolfsson saw opportunity and prospered. It's a must-read for anyone with entrepreneurial spirit, showing the riches that can be achieved, but it's also a cautionary tale against exuberance and overambition. Bjorgolfsson's reputation went up in smoke and he was vilified in his native country. From the adventurous highs and devastating lows, he learned the important lessons of responsibility and accountability. Two days after the publication in April 2010 of the Icelandic government's report on what happened in the financial crisis, he issued a public apology on the front page of Frettabladid, Iceland's largest newspaper. He made good on his promises to repay creditors and has risen out of the ashes to become – on paper at least – a billionaire again, this time 'humbler, wiser and more sanguine about the surprises and setbacks that life can thrown up'. Autobiographies have a habit of being sugar-coated, slanted to portray the author as a hero but this isn't the case here. Bjorgolfsson's account comes across as forthright, honest and candid; he doesn't flinch from scrutinising his own motives in wading ever further into debt. It is a fantastic account of a life's journey, of what can be achieved, of how easily it can be lost and how long and hard you have to fight to regain your dignity and pride. In my own case, I don't have the drive and ambition to try and flourish again. I love and cherish my family and try my best to provide for them; that is sufficient for me. But I admire Bjorgolfsson's resilience and, after reading his book, believe that he won't be making the same mistakes again.